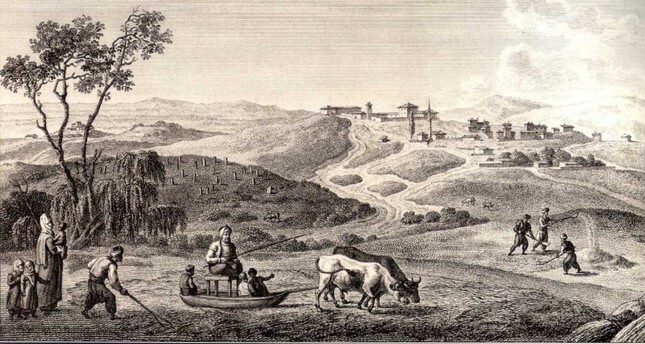 A gravure shows Ottoman farmers working on their fields. In Turkish, the cannabis plant is also known as "kendir," which is also the name of the fiber made out of it. The fiber and seeds of the cannabis plant are used to make a variety of different products around the world. It is prohibited in many countries because of its miscellaneous use as a drug. However, industrial hemp is used in the production of many things, including fabric, yarn, naval materials, cosmetics, vehicle frames, soap and cellulose. It was commonly grown during the Ottoman era. Cannabis was first planted in the mild-temperate regions of Eastern Asia. Later, it spread to West Asia, Anatolia, Egypt and Europe. It was first sown in the U.S. in the 17th century. Its fiber was a significant raw material in twine, yarn, rope, cable yarn and fabric production. Most of the materials like rope and cable yarn, which the Ottoman Navy needed, were produced from cannabis fiber. Back then, cannabis was mostly cultivated in the Black Sea region. Cannabis cultivation was extensive in the provinces of Samsun, Sinop, Kastamonu, Amasya, Çorum, Tokat, Yozgat, Ordu, Burdu, Urfa and Malatya. It was also cultivated in the districts of Taşköprü, Vezirköprü, Gümüşhacıköy, Merzifon, Çarşamba, Terme, Ünye, Fatsa, Ödemiş, Tire, Suruç and Birecik. In Sinop, Kastamonu, Taşköprü and Vezirköprü, industrial hemp was cultivated, processed and turned into different products. Local people used to sell some of the crops and use the rest to produce things like fabric, twine, rope and sacks. Small family manufacturing workshops started popping up in the region. Kastamonu and its environment had cultivation sites which were fertile in terms of cannabis agriculture. A lot of cannabis would be planted in the fields around the Gök River and regions where this river met the valleys. The region was an important ground where cultivation, processing and export of industrial hemp took place. Taşköprü and its nearby places were among the places where hemp was cultivated the most. A wax figure representing Ottoman rope production at Tokat City Museum. Production of hemp fiber and rope continued until the end of the empire. There was even an inn named Kendir Inn (Hemp Fiber Inn) where hemp and hemp products were sold and craftsmen dealing with hemp worked in the surrounding region. Products bought for the navy from Kastamonu and nearby places were exported through the İnebolu pier. Some 90,981 kilograms of hemp were produced in Taşköprü in 1520; 20,484 kilograms were obtained in Tokat and nearby places in 1574. While the amount was 354,794 kilograms in Trabzon in 1554. Farmers produced around 349,858 kilograms of hemp in Akçaabad in 1554. The region of Samsun was also one of the most important production centers. Ottoman explorer Evliya Çelebi said that in Samsun people dealt with hemp and hemp-yarn. Nearly 10 percent of the agricultural production in the region was hemp. The state got the necessary hemp from Samsun and nearby places as state taxes. Approximately 5,612 houses in the region were giving 1,600 kilograms of hemp to the state as tax. Hemp and hemp products were sent via the port of Samsun. String: It was one of the thinnest products obtained from hemp. It was produced, especially in Rize and nearby areas, and was one of the important means of making a living in the region. Dresses for summer months, bed linens, upper sheets and hijabs were produced from it. It was also used to produce awning, fishnets, sacks, warn yarn used in carpet weaving and tents. Twine: It was produced in thicker form than string. Cable yarn: It was the most frequently used product made from hemp and was used in packing and baling. It was produced at the size and length that the customer wanted or was sold, being produced in line with standardized sizes. Cable yarn makers who produced damaged cables were revealed in the presence of the public, so that buyers knew these yarn makers had produced inferior products. Rope: Thicker than cable yarn and used in ships.